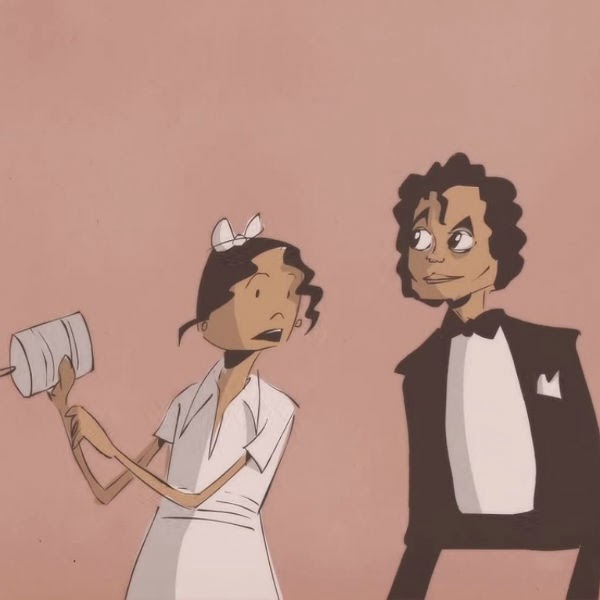 This is a highly entertaining 1980 interview with Michael Jackson, put into animated form by our friends at Blank on Blank via PBS digital studios. He discusses the true source of his singing - Godliness - and everything else that explains his unexplainable talent. He reveals for us what sets the peacock apart, what you would experience at a Jackson concert, that "I do believe deeply in perfectionism," and what it meant to meet Quincy Jones: "we worked beautifully together." Among other things, you find out why "The Wiz" was so important to Michael, and what classic song Michael did in one take. And it was an amazing performance regardless of how many takes it took; that he could just walk in and belt it out perfectly, so much so that the jaded sound guy said to forget bothering with any other takes, because that take couldn't be topped, is nothing short of amazing. And that was before Michael became the humongous star he later evolved into. Incidentally, Michael is quite well-spoken. He speaks in asides, in complete sentences, with emphasis in the right places, modulating his tone in an entertaining way - he really sounds like a fun fellow to be around. Of course, it all has gotten a bit to his head - he feels he has a "destiny" and is fine with "being put up on that pedestal" - and that is understandable considering he had already been a major star for 15 years at that point and wasn't even at the absolute pinnacle of his fame yet. Sister Jane was 13 years old at the time, and Michael used her as his interpreter - though the interviewer, well, spoke pretty good English. In fact, it sounds like his native tongue. In fact, it almost certainly is his native tongue. But Janet does a terrific job of re-asking the questions, one can hear in her terrific re-questioning that Michael wasn't the only one in the family with talent! This is the full-on Blank On Blank animation treatment via PBS, but they don't have to do much to keep your attention - Michael does that all by himself - via his sister. Jackson told interviewer John Pidgeon - through his sister - "My singing is just, I'll just say it as simple as possible, it's just Godly really. When I was small I didn't really know what I was doing, I just sang and it just came out sounding pretty good. I just do it and it happens." Now, it's easy to make fun of that, but what he meant apparently was that it was simply natural and instinctive, with no crafting of his sound. At least, hopefully that is what he meant. "'One thing,' she said, as if it was an insignificance she had overlooked and just remembered, 'you don’t mind if his sister sits in on the interview, do you?' Already aware of a distant figure on a marshmallow sofa, I shook my head readily. 'Of course not, Shirley,' I assured her with a smile. 'What’s her name?' 'Janet.' 'Janet,' I repeated. 'Oh, and one more thing…' Shirley paused, to ensure she had my attention. Anticipating another trivial afterthought, I wasn’t ready for the bomb Shirley was about to drop. 'If you could direct your questions to Janet, she’ll put them to Michael.'" Yes, there was a time when nobody had heard of Janet Jackson. Pidgeon also described Jackson's answers as "consistently unilluminating," adding: "It quickly became clear that he had little understanding either of the history of black music or of his place in it." Michael does talk about disco, though. It doesn't sound as if he even considers it a different form of music. It's all just "sounds," which sounds like a perfect way to think about it. However, Pidgeon's unique reaction notwithstanding, it truly is a fascinating interview, and not in a let's-make-fun-of-Michael's-weirdness way. Michael's emphasis on perfectionism rings true, and the emphasis on the sound as opposed to the meaning - "it's just beautiful" - is precisely spot on. He admits that he doesn't work on his dancing, it just "happens." Oh - the peacock is important because it "integrates." Listen to find out what he means by that. And, yes, Janet does ask the questions again for Micheal, pretty much verbatim, though she sometimes has difficulty remember what it was - she was only 13!